FOXBOROUGH — Danny Amendola left the Patriots’ 20-13 victory over the Bills in the third quarter with a knee injury. He limped off after waving off a Buffalo punt. Amendola was attended to by the medical staff on the bench for a while, before being spotted standing and talking to offensive coordinator Josh McDaniels. He was listed as questionable to return, but never did. The 5-foot-11-inch, 190-pound sparkplug had been a standout before his exit, collecting a team-high nine catches for 117 yards on 12 targets. Amendola was doing his his part to make up for the absence of Julian Edelman. Amendola also had three punt returns, including one for 21 yards. “I don’t know anything about that injury,’’ said James White when asked about Amendola. 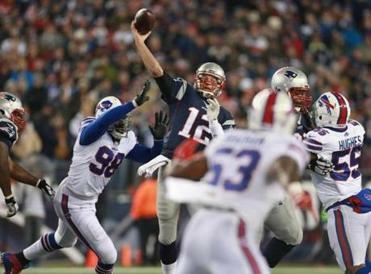 It was a grind on Monday night against the Bills, but the Patriots did just enough to remain unbeaten. The Patriots also lost receiver Aaron Dobson to an ankle injury in the second quarter on a play in which he made a nifty 17-yard reception from Tom Brady. Dobson had been a late addition to the injury report Monday with a back ailment but got the call after testing well in pregame. Lots of Patriots are known for their pregame rituals. Defensive end Chandler Jones can be spotted taking laps around the field half-jogging and half-dancing with his headphones on. Running backs LeGarrette Blount and White like to groove in the end zone, perhaps rehearsing a dance they’d like to show off later in the game. Edelman goes through a number of catching drills — including his noted succession of one-handed snags. Tight ends coach Brian Daboll runs sideline to sideline wind sprints. And then there’s defensive coordinator Matt Patricia. Recognizable in his Santa-red apparel and a beard thick and long enough to withstand even the coldest nights at Gillette Stadium, Patricia is among the most fired-up characters on the field. Patricia makes contact with every player — offense and defense. Sometimes it’s a quick high- or low-five and other times it’s a full-on hug as he does his best to pump up his guys. And certainly Patricia has good reason to be fired up this season. Entering the “Monday Night Football” showdown against the Bills, Patricia’s defense was ranked 16th overall (343.8 yards per game) — including second against the run (88.2). Patricia, now in his fourth season in his current role, is one of the smartest coaches in the NFL. And that’s not hyperbole. Patricia has a degree in aeronautical engineering and a master’s in education. Just how smart is Patricia? Bill Belichick summed it up pretty well last week. “This guy could probably build a plane and fly it — like this guy is smart-smart,’’ said Belichick. “He’s got great recall and a really high IQ level in terms of just processing a lot of information. Belichick said Patricia’s institutional knowledge — this is his 12th season in New England — and the system are invaluable. “Matt and I have worked together for a long time so he’s definitely a huge asset to me in a number of areas — again both historically, like, ‘Hey this is what we did in this situation, think about that or should we do that again or the timing of it and so forth.’ And again over a period of years, Josh [McDaniels] is the same way, over a period of years, things that you did five, 10 years ago, I’m not saying they come up every day, but it might be, ‘Hey remember when we did this against so-and-so back in ’07 or ’05 or whatever?’ It’s kind of the same thing here. After connecting on a field goal and an extra point in the first half Monday night, Gostkowski missed a 54-yard attempt in the third quarter. Gostkowski had made 22 field goals in a row this season, 32 in a row overall. His last miss was nearly a year ago — Nov. 30, 2014. Gostkowski made good on his next attempt, from 35 yards at the end of the third quarter. As for extra points, Gostkowski hasn’t missed one since 2006, his rookie season. With the two Monday night, he has made 447 in a row, an NFL record. Team president Jonathan Kraft was asked on his pregame radio appearance about the apparent anger Patriots fans have toward ESPN (which broadcast Monday night’s game) in the wake of the Deflategate scandal. “I don’t think ESPN, the day after the AFC Championship game, said, “Hey, we want to go get the Patriots.’ They, as a conduit to the public, sometimes they’re given information, and the information isn’t accurate. Unfortunately, we ended up with what we ended up with. The Patriots will have to make decisions Tuesday on the statuses of linebacker Dane Fletcher (torn ACL) and defensive tackle Chris Jones (calf). Both have been on the physically unable to perform list and will either need to be activated or placed on injured reserve. The Patriots have six linebackers with Jamie Collins (out with an illness), Dont’a Hightower, Jonathan Freeny, Jerod Mayo, and Eric Martin. At tackle, the team has been solid with the rotation that includes Alan Branch, Sealver Siliga, Dominique Easley, Malcom Brown, and Akiem Hicks. Speier: How have other NFL teams finished after starting 10-0? Michael Whitmer of the Globe staff contributed to this report.